PurposeDevelop a framework for efficient free‐breathing simultaneous whole‐heart coronary magnetic resonance angiography (CMRA) and cardiac positron emission tomography (PET) on a 3 Tesla PET‐MR system.MethodsAn acquisition that enables nonrigid motion correction of both CMRA and PET has been developed. The proposed method estimates translational motion from low‐resolution 2D MR image navigators acquired at each heartbeat and 3D nonrigid respiratory motion between different respiratory bins from the CMRA data itself. Estimated motion is used for correcting the CMRA as well as the emission and attenuation PET data sets to the same respiratory position. The CMRA approach was studied in 10 healthy subjects and compared for both left and right coronary arteries (LCA, RCA) against a reference scan with diaphragmatic navigator gating and tracking. The PET‐CMRA approach was tested in 5 oncology patients with 18F‐FDG myocardial uptake. PET images were compared against uncorrected and gated PET reconstructions.ResultsFor the healthy subjects, no statistically significant differences in vessel length and sharpness (P > 0.01) were observed between the proposed approach and the reference acquisition with navigator gating and tracking, although data acquisition was significantly shorter. The proposed approach improved CMRA vessel sharpness by 37.9% and 49.1% (LCA, RCA) and vessel length by 48.0% and 36.7% (LCA, RCA) in comparison with no motion correction for all the subjects. Motion‐corrected PET images showed improved sharpness of the myocardium compared to uncorrected reconstructions and reduced noise compared to gated reconstructions.ConclusionFeasibility of a new respiratory motion‐compensated simultaneous cardiac PET‐CMRA acquisition has been demonstrated. Magn Reson Med 79:339–350, 2018. © 2017 The Authors Magnetic Resonance in Medicine published by Wiley Periodicals, Inc. on behalf of International Society for Magnetic Resonance in Medicine. This is an open access article under the terms of the Creative Commons Attribution License, which permits use, distribution and reproduction in any medium, provided the original work is properly cited. Generalized autocalibrating partially parallel acquisitions (GRAPPA). In this study, a novel partially parallel acquisition (PPA) method is presented which can be used to accelerate image acquisition using an RF coil array for spatial encoding. This technique, GeneRalized Autocalibrating Partially Parallel Acquisitions (GRAPPA) is an extension of both the PILS and VD-AUTO-SMASH reconstruction techniques. As in those previous methods, a detailed, highly accurate RF field map is not needed prior to reconstruction in GRAPPA. This information is obtained from several k-space lines which are acquired in addition to the normal image acquisition. As in PILS, the GRAPPA reconstruction algorithm provides unaliased images from each component coil prior to image combination. This results in even higher SNR and better image quality since the steps of image reconstruction and image combination are performed in separate steps. After introducing the GRAPPA technique, primary focus is given to issues related to the practical implementation of GRAPPA, including the reconstruction algorithm as well as analysis of SNR in the resulting images. Finally, in vivo GRAPPA images are shown which demonstrate the utility of the technique. Copyright 2002 Wiley-Liss, Inc. Accelerated image reconstruction using ordered subsets of projection data. The authors define ordered subset processing for standard algorithms (such as expectation maximization, EM) for image restoration from projections. Ordered subsets methods group projection data into an ordered sequence of subsets (or blocks). An iteration of ordered subsets EM is defined as a single pass through all the subsets, in each subset using the current estimate to initialize application of EM with that data subset. This approach is similar in concept to block-Kaczmarz methods introduced by Eggermont et al. (1981) for iterative reconstruction. Simultaneous iterative reconstruction (SIRT) and multiplicative algebraic reconstruction (MART) techniques are well known special cases. Ordered subsets EM (OS-EM) provides a restoration imposing a natural positivity condition and with close links to the EM algorithm. OS-EM is applicable in both single photon (SPECT) and positron emission tomography (PET). In simulation studies in SPECT, the OS-EM algorithm provides an order-of-magnitude acceleration over EM, with restoration quality maintained. 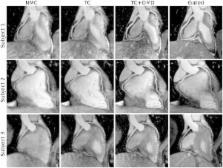 Three-dimensional registration of cardiac positron emission tomography attenuation scans. Free-breathing whole-heart coronary MR angiography on a clinical scanner in four minutes.